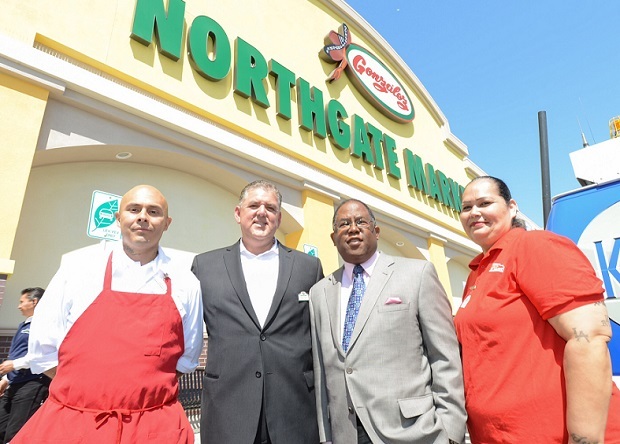 Supervisor Mark Ridley-Thomas at the opening of the Juanita Tate Marketplace. The Board of Supervisors voted to support state legislation that would reestablish a statewide redevelopment program – but only if these have the support of local governments, require a more robust commitment to produce affordable housing, and focus on communities with the greatest need. Dunbar Hotel rendering with CRA funded affordable housing on each side. Since 1945, local jurisdictions have operated redevelopment agencies to reduce blight and incentivize the development of low and moderate-income housing. 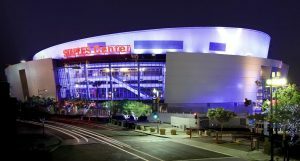 Community Redevelopment Agency of Los Angeles helped build the iconic Staples Center. 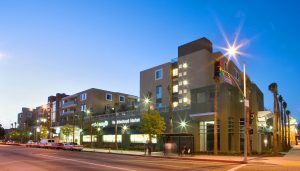 Before closing its doors, the Community Redevelopment Agency of Los Angeles produced more than 26,000 units of affordable housing, and also helped build several iconic landmarks such as the Juanita Tate Marketplace, Staples Center, LA Live, Broad Museum and Dolby Theater in Hollywood. In 2012, then Governor Jerry Brown eliminated redevelopment agencies to balance the state budget and restore property tax revenue for local governmental services. While local jurisdictions benefited from increased general fund and special district revenue, the dissolution of redevelopment agencies took away about $1 billion a year that had previously been available for affordable housing. It also eliminated a vital tool for addressing blight and reinvesting in low-income communities. – require that new redevelopment programs focus on communities with urban blight, and economic distress, as well as those with transit-oriented districts, excess state properties and priority projects. 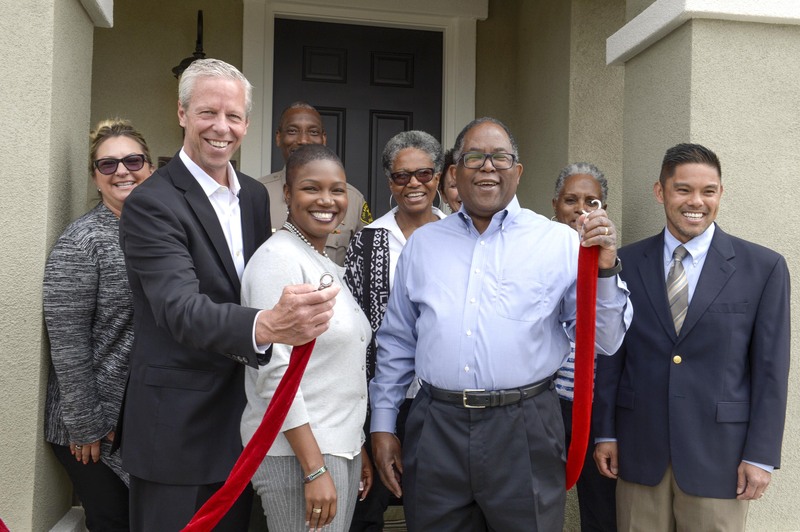 Magnolia Walk Ribbon Cutting in 2018 — affordable housing funded with residual redevelopment funds. Photo by Karen Quincy Loberg / Board of Supervisors. 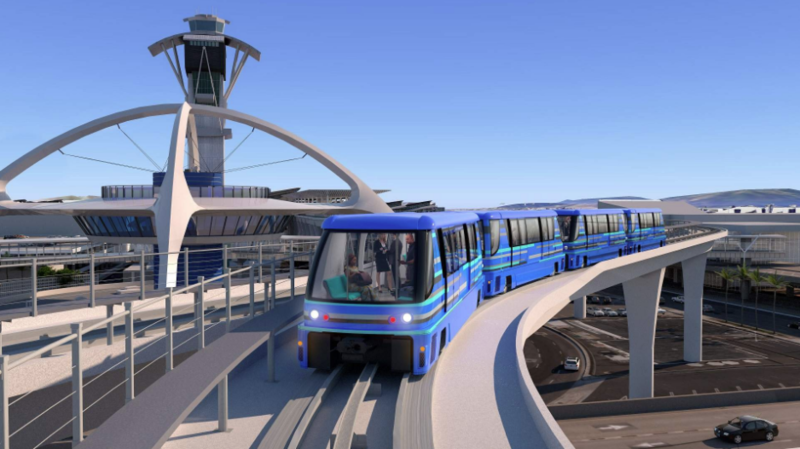 Construction is under way on the $4.5-billion Automated People Mover (APM), a 2.25-mile electric train system to LAX that should be fully operational by 2023. 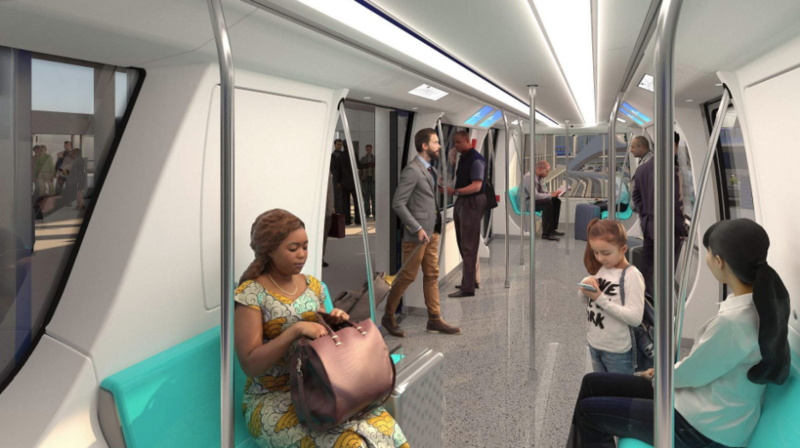 The APM system will includes six stations — three outside the airport terminal loop and three inside. 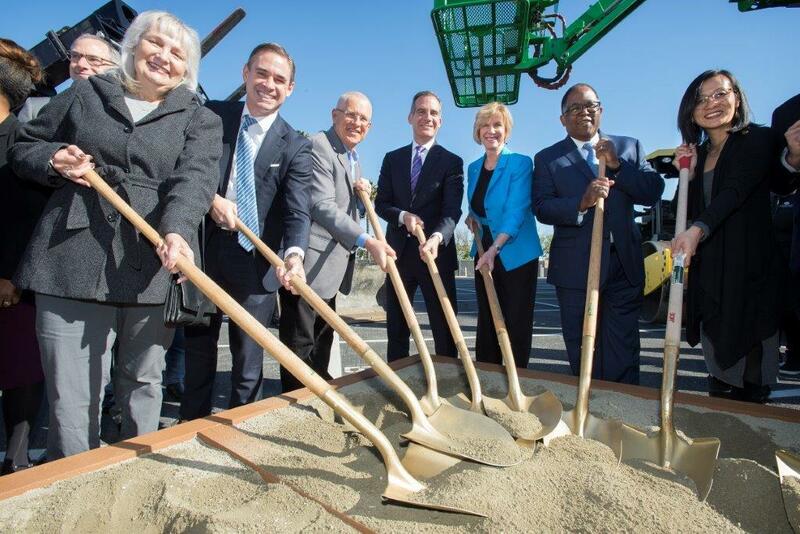 It will connect with the Los Angeles County Metropolitan Transportation Authority’s light rail system. Once operational, APM trains will pick up passengers at each station every two minutes, with a total of 10 minutes travel time end-to-end. Free to use and always operational, the APM system is expected to carry 30 million passengers a year. Its fleet of 44 cars will be fully electric powered, offsetting the carbon equivalent of about 12 million vehicle miles driven. 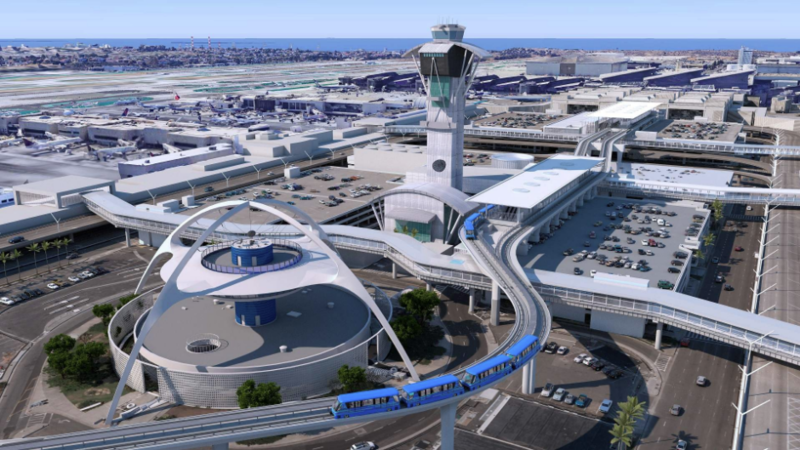 The project is expected to create more than 2,000 construction jobs, a third of which are reserved for residents of Los Angeles as well as communities near LAX that are most affected by the project. About 60 percent of careers during the 25-year operations and maintenance phase are designated for local workers. LINXS, the selected developer for APM — has built partnerships with community-based organizations to make jobs available to diverse groups of people. The project is expected to create infrastructure career pathways for women, former foster youth, individuals in reentry and transitioning out of gang involvement, and persons with disabilities. HireLAX, LAWA’s Apprenticeship Readiness Program, has been a key partner in this effort. Of their 82 graduates so far, 66 have been residents of 2nd District. For more information, visit FlyLAX.com/ConnectingLAX. The Board of Supervisors honored the Los Angeles Football Club (LAFC) for its record-breaking Major League Soccer season and contributions to Los Angeles County’s creative economy. LAFC supporters and members of leadership, including President and Co-Owner Tom Penn and EVP and Chief Business Officer Larry Freedman, were on hand for the presentation led by Supervisor Mark Ridley-Thomas who represented the district that includes the Banc of California Stadium. “In its inaugural season, LAFC has established itself as a force both on and off the field,” Supervisor Ridley-Thomas said. From its inception, LAFC has demonstrated a strong commitment to its surrounding community and the Greater Los Angeles area. Last year the club established The LAFC Foundation to implement programs in underserved schools and neighborhoods, with a focus on South Los Angeles. More than 7,000 tickets have been distributed to residents of the community, and the Banc of California Stadium includes 125,000 square feet of publicly accessible plazas and open space. The Banc of California Stadium was built under a project labor agreement. Over $70 million was invested in the construction workforce, which achieved its goal of 40% local hires, and more than $25 million was invested into communities within 10 miles of the stadium. Over 3,000 workers were employed during its construction. LAFC is the newest MLS soccer club serving the greater Los Angeles area. LAFC is dedicated to building a world-class soccer club that represents the diversity of Los Angeles and is committed to delivering an unrivaled experience for fans. Los Angeles County launched a new program to train hundreds of new workers for the rapidly growing bioscience industry. The Bio-Flex Initiative offers pre-apprenticeships and registered apprenticeships that could lead to employment opportunities in some of the County’s leading bioscience companies, such as Bachem, Thermo Fisher Scientific, Takeda, and many more. Los Angeles County Workforce Development, Aging and Community Services (WDACS) also provided funding for Bio-Flex participant training. The South Bay Workforce Investment Board (SBWIB), meanwhile, is coordinating program development and implementation. Bio-Flex will support a regional network of partners that will ensure employment opportunities in bioscience are widely available to all. Initial partners include Biocom, the LA Economic Development Corporation, the Center for a Competitive Workforce, and many colleges and universities. In collaboration with those partners, Bio-Flex aims to create a flexible yet structured career pathway for high school graduates and college level students, veterans, underserved populations, new hires and incumbent workers who might otherwise have challenges accessing this industry. Bio-Flex will provide workforce readiness training, industry-specific occupational skills and work-based learning experiences. The program is designed to culminate in an industry-recognized career credential. Bioscience is one of the fastest-growing industries in the County, employing more than 230,000 people with an average annual wage of more than $72,000 in 2017, according to a report by Biocom, an advocate for California’s life science sector, serving members across industries in pharmaceuticals, medical devices, biotech, digital health and more. Job opportunities are opening up for young and semi-skilled workers, as well as for scientists and entrepreneurs. 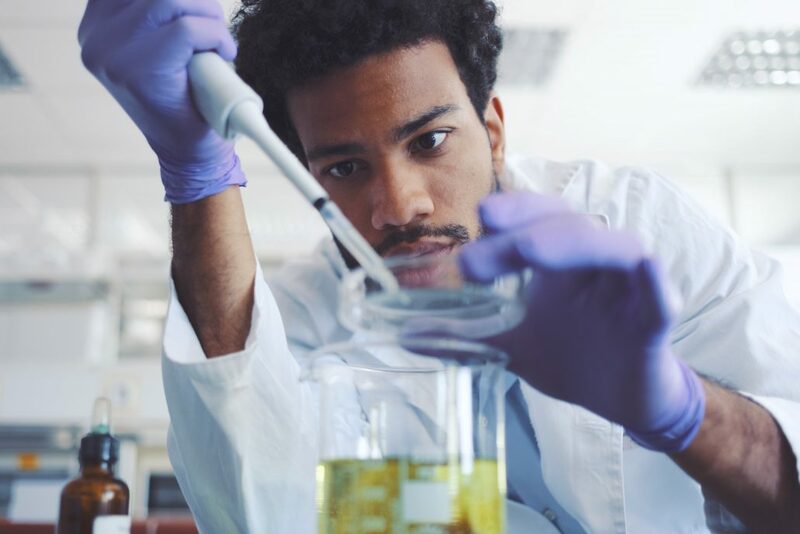 According to a 2018 study by the Coalition of State Biosciences Institute, more than 25 percent of jobs in bioscience do not require a bachelor’s or advanced degree. 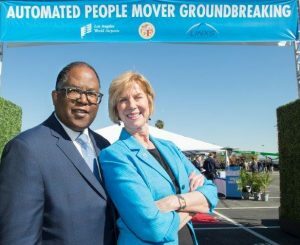 Supervisor Ridley-Thomas has consistently supported the growth of the bioscience industry, including championing the launch of Bioscience Los Angeles County (BioLA), a nonprofit corporation created to accelerate the growth and development of the County’s bioscience industry. The County has also funded bioscience incubators at California State University Los Angeles and at LA BioMed on the Harbor-UCLA Medical Campus, and allocated $15 million to create a Bioscience Investment Fund for early-stage startups. If you are interested in being an industry partner or pursuing a career in Bioscience, please contact the SBWIB at (310) 970-7700 or dshepard@sbwib.org and visit www.sbwib.org/bioflex for more information. Local small businesses are poised to get a boost from a new client: Los Angeles County. 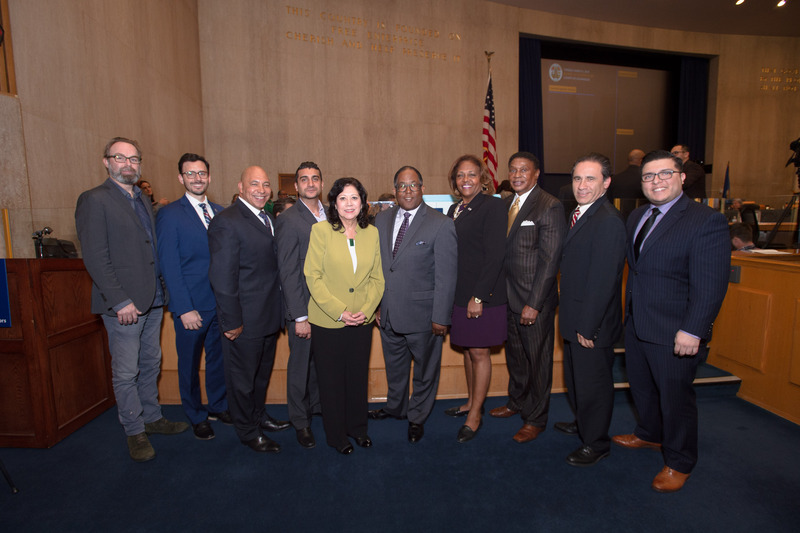 The Board of Supervisors unanimously approved a motion reaffirming their commitment to award 25 percent of the County’s $3.9 billion in eligible annual procurement awards to Local Small Business Enterprises (LBSEs) by 2020. The motion called for developing an implementation plan and strategy to streamline the procurement process. Since the Board first set the 25 percent goal in 2016, the County has more than doubled its contracting with small businesses. Its Economic Development Report Card showed LSBEs were awarded $355 million in the fiscal year 2017-2018, equating to a 9 percent utilization rate. In just the first half of fiscal year 2018-2019, $321 million has already been awarded to LSBEs, putting the County on track to reach its highest utilization rate. The Supervisors’ motion instructed the Departments of Consumer and Business Affairs and Internal Services to present an implementation plan to the Board in April. This should include recommendations for pursuing a regional business certification program and marketplace, a modern e-procurement system, and legislative solutions.